Adopted on October 21st, 1985, the flag consists of three vertical bands of blue, yellow and green with three diamonds in the center representing the Grenadine Islands which are part of the country. They also recall the nickname for Saint Vincent as 'the gems of the Antilles.' 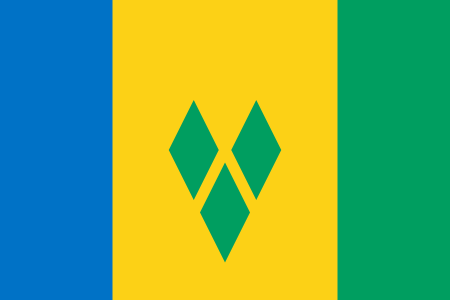 The blue in the flag represents the tropical sky and the crystal waters, the yellow stands for the golden sands of the Grenadines and green is for the lush vegetation of the islands. The diamonds are set lower in the flag recalling their geographic location in the Antilles chain. 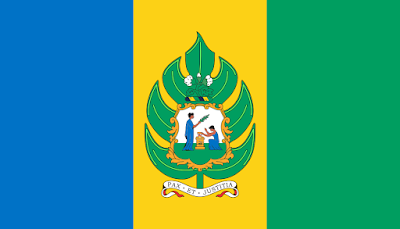 From 1979 to 1985, Saint Vincent and the Grenadines used variants of this flag- which, instead of the diamonds, have a realistic breadfruit leaf and the arms of Saint Vincent and the Grenadines in the center of the flag. The arms of Saint Vincent and the Grenadines are kind of interesting actually- from the top down- though it's hard to see on the flag- you've got a cotton plant at the top, the centerpiece is taken from a colonial badge used from 1907 to 1979 and features two women in classical Roman dress- the one of the right holds an olive branch, the one of the left holds the scales of justice and kneels before the gold altar between them. 'Pax et Justicia' of course, means exactly what you think it does: Peace and Justice. So that's Saint Vincent and the Grenadines! Remember, until next time, keep your flags flying- FREAK or otherwise!